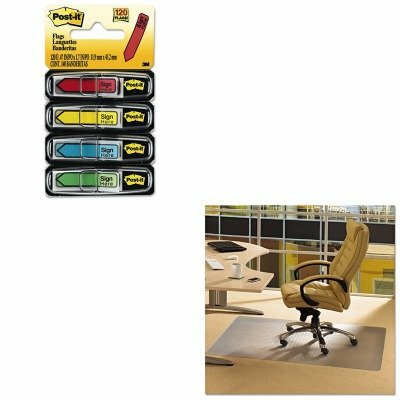 KITFLRPF119225EVMMM684SH - Value Kit - Floortex Cleartex Advantagemat Phthalate Free PVC Chair Mat for Low Pile Carpet (FLRPF119225EV) and Post-it Arrow Message 1/2amp;quot; Flags (MMM684SH) by Floortex at Momiji Studios. MPN: FLRPF119225EVMMM684SH. Hurry! Limited time offer. Offer valid only while supplies last. lt;stronggt;MMM684SHlt;/stronggt;lt;BR/gt;Post-it Arrow Message 1/2amp;quot; Flagslt;BR/gt;Request action for specific tasks and get fast results. lt;stronggt;MMM684SHlt;/stronggt;lt;BR/gt;Post-it Arrow Message 1/2amp;quot; Flagslt;BR/gt;Request action for specific tasks and get fast results. Save yourself or your employees the trouble of having to provide instructions for multiple signature placement. These arrow message flags with a black border do all the work for you. For convenience and quick application, the removable and repositionable flags are housed in a pop-up dispenserso you will always have them on hand. Write on flags with ballpoint pen or pencil. Colors: Assorted Messages: SIGN HERE Dispenser: Pop-Up.lt;BR/gt;lt;BR/gt;lt;stronggt;FLRPF119225EVlt;/stronggt;lt;BR/gt;Floortex Cleartex Advantagemat Phthalate Free PVC Chair Mat for Low Pile Carpetlt;BR/gt;Affordable, long-lasting protection for home or office. Unique formulation delivers the clearest, most durable PVC mat. Free from the phthalate plasticizers that have been banned from children's toys and medical instruments. Gripper back holds mat securely in place. Guaranteed not to crack, chip, break or shatter in normal use and correct application. Mat Type: Chair Mat Application: Carpet Materials: Phthalate-Free PVC.